Batch Picking is a way of grouping multiple orders into small batches - typically including 8 to 16 orders – operators fill all orders in the batch at the same time, working from a consolidated pick list. Let’s start with a real life reference point - the grocery store. You go every week with your grocery list, you push a cart up and down the aisles – filling your cart with the items from your list. 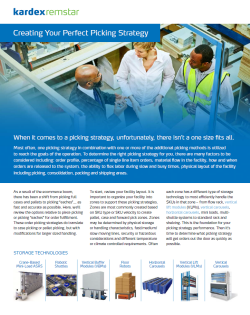 In material handling lingo we call that “single order picking” with a “paper pick list”, fancy I know. Now, what would happen if you took your grocery list, your moms grocery list, your sisters grocery list and your neighbors grocery list and combined them into one grocery shopping trip? Well, first of all you’d be one heck of a nice person to do their shopping for them. When you get to the grocery store, you have 4 separate grocery bags in the cart, one for each person you’re shopping for. You walk up and down the aisles picking the grocery items from the list – you grab 6 cans of soup instead of the one you usually get. You then put one in your bag, two in your moms, three in your sisters and none in your neighbors bag (he’s not a chicken noodle fan). You travel through the grocery store, up and down the aisles just one time, but picking enough groceries to fill all four lists – THIS is batch picking. Makes sense right? 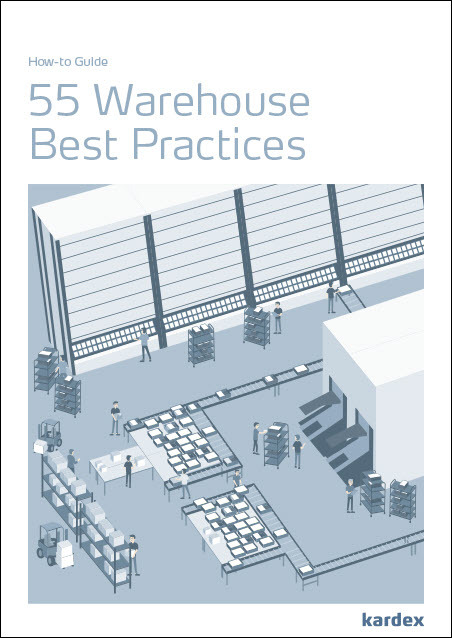 Ok, back to the warehouse – using batch picking, an operator picks multiple items from one storage location and distributes them among a batch of orders. Just like the grocery store. 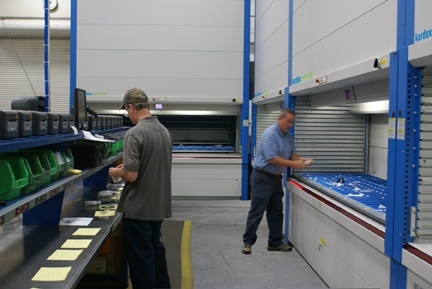 In a manual picking operation involving rack and shelving the operator can use a mobile batch cart, pushing a batch cart with multiple order boxes throughout the warehouse to fill orders. The order batching and picking activities are driven through WMS or inventory management software. The batch size is limited by the physical size of the batch carts and the operator needs some type of software driven device to drive picking activities. 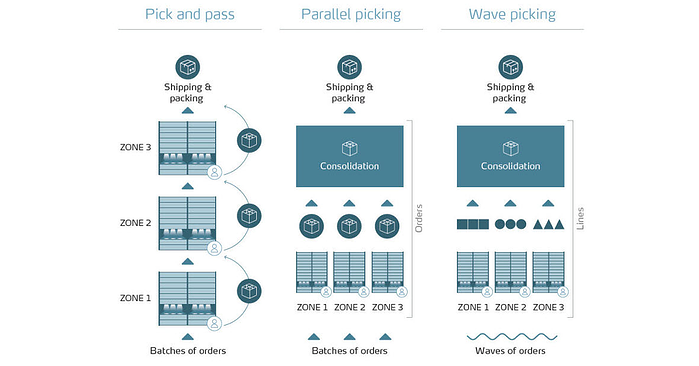 The same batch picking concept applies to an automated order fulfillment operation. The zone is typically setup with at least two automated storage units arranged next to each other with a batch station 6- 8 feet in front of the access openings. The operator works in the middle. The operator can manually select the orders to batch from the software. More often, the software automatically creates the batch of orders based on order profile (SKU commonality), customer delivery date, shipping carrier cutoff time or another predetermined criteria. Once the batch of orders is created within the software, the operator now needs to setup the batch station. Each order location on the batch station is fitted with a put light to direct the operator during picking. 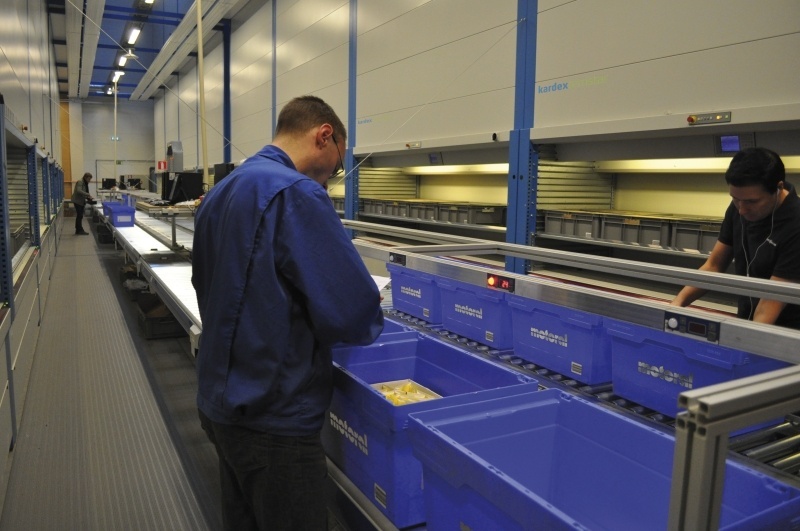 To start the batch picking process, the operator uses a bar code scanner to scan the batch station location and the order tote or box, matching or marrying them within the software. Now the software knows the put location of each order. When ready, the operator initiates the automated storage devices to retrieve and deliver the SKUs required to fill the batch of orders. The first SKU is delivered to the operator and a pick light illuminates on the storage device directing the operator to pick a specific quantity. The operator picks the quantity as directed, and pushes a confirm button. They then turn to the batch station to the waiting put lights and distribute the first SKU among the waiting orders. As the SKU is added to each order, a confirmation button is pushed to indicate SKU was placed in the waiting order. 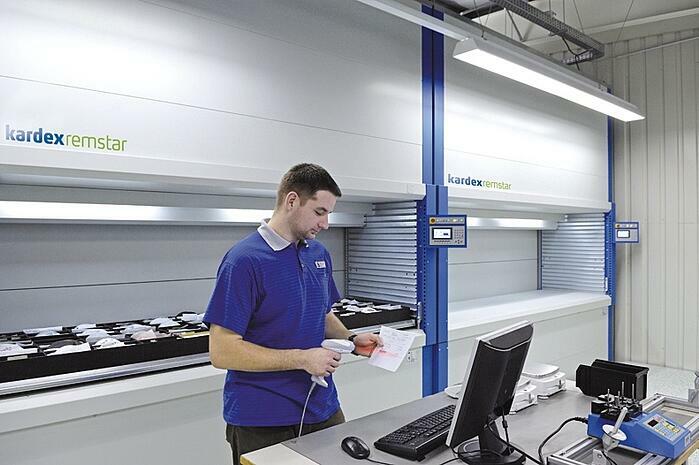 When all SKUs are distributed among the batch of orders, the operator turns back to the storage units to pick the next SKU needed for the batch of orders. As the first machine is working to retrieving another SKU, the second machine has a the next pick ready so the operator is never waiting. This is the reason for two machines in the work zone, to ensure the operator is rarely, if ever, waiting on product to be delivered. With proper SKU slotting, wait time should be minimal. The operator picks in this round robin style until all SKUs for the order are filled. The order is then pushed off onto conveyor or the batch cart can be manually rolled to the next area for fulfillment or directly to shipping. In pick and pack operations, instead of batching the items into an order tote, you can pick orders directly into a shipping tote. Now that you know what it is, why the heck would you use it? Speed! The main benefit of batch picking is the increased throughput rates you can achieve. What kind of rates? Glad you asked. Throughput rates are always application dependent (what sized parts are you picking?, are you bagging and tagging?, is there a pick verification step?, etc.…). Generally speaking you can achieve about 50 lines per hour per person from a standard rack and shelving layout. 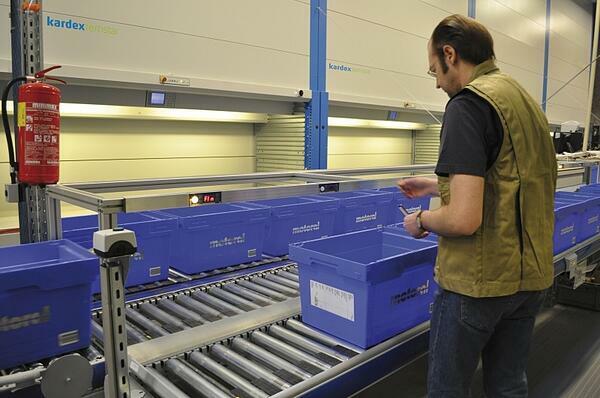 Moving inventory into automated storage and retrieval systems will double your throughput. Add pick to light technology to double it again (and increase accuracy), and finally incorporate batch picking to reach about 400 lines per hour. But the fun doesn’t end there – if it’s faster picking you need, consider more advanced strategies such as color picking or cross picking.